DESCRIPTION: Big Air Jumpers is pleased to offer play centers for toddler aged children. These units are specifically designed to encourage growth and learning through play. Complete with an open bounce area, a mini obstacle course and slide and even a ball pit (balls not included), this unit ensures safety and fun all in one! The Castle Play Center unit comes packed with lots to do within this great unit. Climb, slide, obstacle course, bounce or just hang out inside this great unit. It allows parents to look inside the unit from all sides with low walls and comes with an entrance safety ramp. How Many Kids Will This Unit Hold? 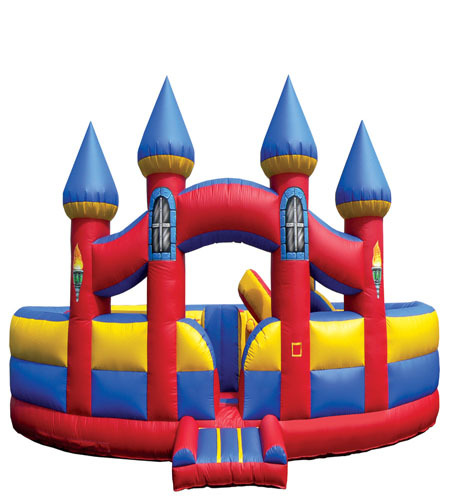 The Castle Play Center will hold 8-10 kids ages 3-8. Electrical Requirements: Requires 2 - 110V Standard Outlets on separate circuits. Prices do not reflect discounts or coupons. Price includes delivery, set up, and tear down to most locations. Some areas outside of our normal delivery area may require a delivery fee. Rental times are for a full day rental which is up to 6 hours of use and does not include set up or tear down time. Make it an overnight rental for only $25 more! Call our office to add this to your order. Based on availability.